Roosevelt expresses a psychological truth that the Buddhist tradition has espoused for two and a half millennia — that our attitude towards ourself conditions our attitude towards others. It’s for that reason that in the development of lovingkindness meditation practice we begin by cultivating metta first for ourselves. We have various lovingkindness meditations available in our online store. Before starting this practice, you will need to read (if you haven’t already) the sections on posture and ways of cultivating metta. Once you’ve read them what will follow will make a lot more sense. In the first stage of the practice, set up your posture and deepen your awareness of your body. Then become aware of how you are feeling. What emotions are present? You don’t necessarily have to label them, just be aware they are there. These emotions will be your focus during the practice. Keep your attention focused on your emotions throughout the practice. If you get distracted, come back to your body, and then to your emotions. To work with your emotions, use a word or phrase, or a memory, or your imagination. As you work with your particular method, be aware of what effect it is having on your emotions, which are your focus. I am very interested in lovingkindness meditation and have read and listened to much about it. My question is what if you cannot achieve the physical pose for meditation? I have physical limitations that prevent the proper posture. Have you checked out our posture workshop? I think you’ll find answers there. If not, get back to me. 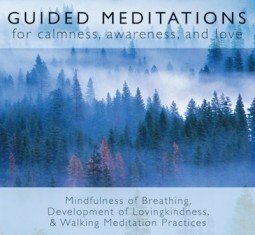 These guided meditations are the fastest route to meditative clarity I have encountered. Your way of meditating infuses the listener, so that one can leave the meditation with new tools in the toolkit , so to speak. I never realized how harsh and judgemental my inner voice was! I think maybe, if you can go that easy on me, maybe I can too. Thanks for your kind comments, Glenn. Finding a more compassionate inner voice takes time, but it’s worth putting in the effort. I remember reading somewhere on here that if you have trouble creating metta towards yourself then you can do the different stages of metta towards different parts of yourself. the first stage, instead of towards a friend, was towards a part of you that you liked, the next stage instead of a negative person was towards something about yourself that you wanted more of, the next stage, instead of towards a difficult person was towards a difficult part of yourself and so on. I would like to read this section again to clarify the stages, but I can’t seem to find it. Can you point me in the right direction please? I have only just discoverd your website but woudl like to thank you for it. I have been practicing meditation for a year now, with varied results but I was really shocked at my emotional response during the self metta audio meditation. As I started saying the 3 well wishing phrases to myself all of a sudden was crying and feeling ..well, I am not sure what really! Just very emotional! It was very poweful. Not sure I can describe it as just sadness – it felt more complex than that. I will continue to practice the self-metta to try and investigate further! Thanks for your appreciation, and for sharing what’s going on in your practice. I look forward to hearing more! I just practiced what i believe to be metta meditation for the first time and it felt a bit amazing, although im not sure if i was doing it “right”. but i usually practice breathing-mindfulness daily and was wondering how should i incorporate metta into my routine. should i stop one and adopt the other or practice both 20 minutes each or what? I’m glad to hear that your lovingkindness meditation took off. One thing to watch for is the expectation that a particular experience that we enjoyed is going to be repeated. The expectation, in general, just leads to disappointment. Usually I suggest to people that they alternate mindfulness of breathing and metta meditation, unless there’s some really good reason for choosing one practice over another (e.g. you’re in a bad mood and need to cultivate metta, or you’re especially distracted and need to calm the mind with the breath). I’ve noticed that when I practice Metta vs when I practice Mindfulness of breathing, I tend to be less focused. In Metta, I often find myself getting lost in thought, whereas in Mindfulness I can control my thoughts much better. In trying to refine my practice, I’ve noticed some things that seem contradictory about Metta. In this section you mention making emotions the focus of our practice. But I don’t understand how to distinguish thoughts from emotions – I feel like every thought comes with emotional content. If I’m focusing on my train of thought, does that even count as meditation? How does this differ from getting lost in thought or daydreaming? Furthermore, should I be focusing on my emotions or rather on wishing myself and others well? How do all these concepts work together? Thoughts and emotions are connected, and as you point out, thoughts have emotional content. But a thought like “He shouldn’t have done that!” is the words passing through your mind, while the emotion of anger is — well — an emotion. It’s something felt. Focusing on your thoughts is certainly part of lovingkindness practice. We need the thoughts to kick-start our emotions, and to change our attitudes so that we become more loving. Why should focusing on your thoughts not be meditation? It’s something you’re choosing to do mindfully. When you’re daydreaming you are not (generally) mindful. It is possible to have a degree of mindfulness present during daydreaming, but mostly people don’t. The mind simply wanders. We’re not conscious that we’re daydreaming. We’re not aware of the effect that the daydreaming is having on how we feel, so we may well be creating distress, depression, etc. Again, in mindfully focusing on your thoughts you know what you’re doing, you know why you’re doing it, and you’re aware of what it’s doing to you. To deal with your last question: I see the focus of the lovingkindness practice as being on the emotional relationship you have with yourself or the other person. The thoughts are simply being dropped in so that they have an effect on the quality of the relationship (hopefully making it more metta-ful). So it’s a complex practice, because you have the image of the person you’re cultivating metta towards, your emotional state as it relates to that person, and the thoughts that you’re dropping in to your mind in order to affect that emotional relationship. It is easy for my mind and heart to be in sync when I am wishing well to those whom I love and those whom I like. However, when I say in my mind I wish you well to someone who has terribly wronged me more than once I feel very insincere and it is difficult to really wish that person well. Is this normal and in time will my emotions follow the words. I’m sure I am not alone in this dilemna as some people have suffered horrendous cruelty at the hands of others. I find it useful to start my lovingkindness practice by acknowledging that I want to be happy, yet happiness is often hard to find, and that I want not to suffer, yet causing myself suffering is hard to avoid. I acknowledge the truth of this, and then I can ask whether some part of me is prepared to root for me as I do this difficult task of trying to find happiness and escape causing myself suffering. I then do this for the friend, the neutral person, and the person I have difficulty with. You don’t have to like the person you have conflict with. You don’t have to love them. You don’t have to think they’re a nice person. You don’t have to forget bad things they’ve done for you. But you can acknowledge that they want to be happy and find happiness hard to attain, and want not to suffer but cause themselves a lot of pain. And it’s not hard, recognizing that they’re just like us in this regard, to want to support them. I’d like to thank you for a wonderful website, which I am enjoying very much and I am sure will help me, as it evidently has others. The recording on this page is a great help, your voice and intonation are just right for me! Thanks, Ana. Your kind words are much appreciated! Thank you very much for your informative and very comprehensive and easy to understand website. It came to me when i really needed it! I have a question on self-metta meditation. I am just beginning with it, but whenever i try it, my heart starts beating very fast. I was just wondering if it’s normal and what could it mean. It’s hard to say what it might mean that your heart races when you cultivate lovingkindness for yourself. It could be that some part of your mind has encoded that it’s bad or dangerous to do this. Sometimes we take on board a lot of guilt. Or maybe you’re excited because on some level you think it’s a good thing? In any event, I’d suggest regarding the racing heart not as a bad thing but just as a “thing.” Be kind to your heart. Direct lovingkindness to those sensations, not to try to get rid of them but just because they’re a part of you and may be connected with some kind of suffering. Do feel free to let me know how you get on. Thank you very much for your answer, i guess it is indeed a feeling of guilt. I will keep on meditating and just accepting it as it is. I have been reading Lovingkindness and want to pursue metta meditation. I have found it difficult to meditate without it being guided. How long should I do each stage of the meditations? A few weeks or a month spent on each stage? Thank you in advance for your time. Usually after two or three weeks people are doing all five stages. You can use a meditation timer set for five minutes per stage, so that’s 25 minutes in total. There are some great timers for smartphones and available online. Slow going for me. I’ve listened to this introduction twice, each time my emotions were all over the place due to events of the day. I was able to obtain a sense of peace over time and acceptance…that is good for today. I will repeat the mantra daily, many times per day: May I be well, may I be happy, may I be free from suffering. Have been looking for a lovingkindness mediation that resonated with me for over 18 months with little success, until finding this, via the current email bulletins. Could previously only appreciate the value of lovingkindness in the abstract, but now it is finally starting to make a bit more sense to me. This meditation felt extremely beneficial and I plan to regularly incorporate it into my newly established meditation routine. Thanks so much for continuing to provide all these wonderful resources. The emotional awareness ecxercise mp3 plays on my computer but the ones for stage 1,2,3,4 don’t. Maybe there’s something wrong with them? The files work just fine. It may be a bug in the media player plugin that we use. I tried renaming the file for stage 1. Could you try that again and see if you get the same result? I seem to remember one time having a silly problem relating to file names. Stage 1 is playing now. Stage 2,3,4,5 are not. Thank you very much, I appreciate this site a lot. I have maybe a suggestion for the site. I have been dealing with many difficult “negative” emotions for a long time basically a mix of anger and anxiety. I think it’s important for people with these kinds of problems to learn to alter our relation with them. Instead of repressing them or acting out on them. Learning to let them be there, embracing them with our mindfulness in the vain of what tich nhat hanh teaches. This is so difficult, could use help with that. Thank you, Tim. So it may well be that it’s the file names that are causing the problems. I’ll change the rest today and see if that works with them as well. Could you stop by later and let me know? We have a lot of resources in our blog on dealing with anger and resentment. If you use the search field at the top of the page you’ll be able to find them, or if you look at the foot of a post and see a relevant tag, like anger, or resentment, you can click on that and see other posts with the same tag. I’ve updated the file names now. I’d very much appreciate if you could check and see if they’re working. So, I’m talking about making, for example, anger the object of meditation. It’s very difficult to not make stories adding to the anger. But I do feel that meditating on those emotions can be really transformative if you can keep the bare attention on it for long times. I think in this respect it’s important to build up some concentration skill with something like mindfulness of breathing..
Ok, I’ll look around some more on the site. So that was it. Weird. Anyway, thank you for letting me know. I’ll fix the rest as soon as I can. Are these files, or others available as downloads? Or are they on the CD? I’d like to listen to them on the train. Thanks for producing a remarkable tesource. Being very aware of what your mind is doing. Probably there’s a feeling of sadness coming up and then your mind is getting caught up in stories about that, and you’re thinking about your “limitations” and this is causing further pain. So notice the tendency to tell yourself these stories, label it “storytelling,” and then let go of the thoughts. When you let go of the stories, pay attention to the feeling of sadness. Notice where it is in the body, its size, shape, etc. Accept that it’s OK to feel sad. It’s a normal feeling. It’s not a sign that there’s something wrong with you. Keep letting go of the stories! Thanks for such a wonderful response. I tried wishing the feeling of sadness, my fearful reactive patterns well. I felt a feeling of wanting to wrench myself off the reactive patterns…sort of aversion to having those thought patterns. It further resulted in fear of having such a wrenching feeling and I was gasping for breath and I suddenly was very afraid of feeling this emotion of fear. My old negative thoughts came back with a bang and now I am afraid to do this very meditation. Is this feeling alright? I am afraid.Please help me. I think this is all fine. Anything painful that happens — the fear, the fear of the fear — just notice where the discomfort is, and send it your love. There’s just a reactive habit established, and so when you notice you have that reactive habit you have a reaction to it. This happens. Just keep seeing all these events as normal and OK, which they are. Thoughts arise. The mind tries to spin stories. None of these are signs that something is wrong or that there’s something wrong with you. They’re just experiences, and the more you can accept them and wish them well, the less they’ll happen in the first place. Thanks Bodhipaksa so much for that response. I feel a sense of relief now. It gives me some hope to rediscover the rough edges of my mind/emotions and accept them with compassion. ..though sometimes I feel the compassion not arising in me. My mind generates Obsessive Compulsive thoughts that I have difficulty accepting and sending love to. Thats my struggle and the physical sensations of anxiety are unpleasant to bear and my mind races with the same negative story again. So I guess it is consistent, persistent effort to send compassion to these fearful thoughts(or the physical sensations or emotions??) that I get. Am I right?? I am sorry for asking so many questions…I am new to this and am clueless. Thanks a lot for your service to humanity!! Thanks a lot Bodhipaksa!! I had a good one yesterday when I truly let discomfort in the body be..just there. I watched as the mind raced urging me to act which I let go. Thanks a lot!! I like the analogy to a toddler having his first tantrum…will use that every time. Peace to every being on earth! I’m very glad to hear that it’s “clicking” for you, Neela. Sorry for the long delay, but I’ve had a rather busy week and weekend. Thoughts are so fleeting that I think it would be hard to direct lovingkindness toward them. I think it would be better to keep focusing on the feelings, which are more stable. When you’re sending messages of lovingkindness to those feelings, in a way you’re communicating with the fearful part of you that’s giving rise to those thoughts, and giving it reassurance. Think of the part of you that’s creating these thoughts as being like a scared dog that’s barking aggressively. You could yell “bad dog” over and over, or you could cower in fear. But neither of those things would make the dog any less fearful or aggressive. If, on the other hand, you take a confident stance and send reassuring messages to the dog, then it’s more likely to relax, calm down, and become friendly. Some parts of the brain are quite primitive and behave just like wild, or poorly domesticated animals. I have to admit, the first time I tried this and was aware of my emotions, it left me out of control. What I mean is, all of a sudden I had a rush of emotion and then it took me a day to calm down and try to sort through everything. Powerful stuff. Sometimes when I do the focusing exercise though, I don’t think I’m feeling anything. I’m trying, but I’m the type that buries emotions deep down inside so sometimes I don’t become aware of emotions until they come spilling out and I can’t control them any longer. I was hoping that this meditation could help with that. This is all normal. Sometimes our feelings are easily activated and we get thrown off balance, but with practice we learn how to accept and allow them. I have to say I no longer think in Freudian terms of emotions being “things” that can be buried. Freud lived in the steam age, and so his metaphors were all based on that kind of engineering — emotions are repressed, build up pressure, have to be released. That’s not how Buddhism sees things at all, and in fact it doesn’t even have a word that corresponds very closely to “emotion.” I also don’t think modern neuroscience would provide any evidence that emotions function in that way. Anyway, mindfulness of the body will help you in having an awareness of your feelings (which may be experienced at times as more intense than you’re used to), and being able to experience them without being thrown off balance. It’s a nice complement to lovingkindness practice. Hi there! First of all I’d like to thank you for making meditation so much easier for a beginner like myself. I’ve been practicing the mindful breathing exercises for about a month and a half now and it has been life changing! However in the past week or so I began the self-metta meditation and I can’t seem to get into it. I feel fine before the practice but once I start tuning into how I’m feeling I begin noticing pain and anxiety. I tried saying to my pain “I love you, I want you to be happy” and then repeating “May I be well, may I be happy, may I be free from suffering” but I can’t seem to feel anything different except frustration because I’m finding it hard to believe that talking to my pain will work. I find that each day I try again, it’s harder for me to go in with an open mind because I know I will be experiencing feelings that are uncomfortable, overwhelming and confusing. Will using words or phrases start to work with time or should I switch to another method, such as memories or imagination? Apologies for the delayed reply, but I’ve been on vacation for the past two weeks and trying to stay away from “work” as much as possible. So I’d suggest bearing with your discomfort. You can say to yourself, “It’s OK to feel this. Let me feel this.” We can end up discovering that most of the pain we feel comes from the resistance we have to feeling discomfort, and that once we are able just to be with our discomfort, we’re actually quite happy. I just came across, or was guided!, to you wonderful website. I’m grateful for that and thank you for the wisdom you are sharing. A quick question. Would it be beneficial to alternate my mindful breathing practise and metta by time of day? For example, breathing in the morning and metta in the evening. If you have time to meditate twice then alternating in that way sounds like a good idea. Thank you of all this information. These are simple steps to take towards a clear view of oneself and our relationship to the world. I have been practising my sitting practise as well as trying to incorporate mindfulness into everyday tasks. At the start I felt like a child seeing the world for the first time. Plants, animals, clouds etc all looked new. (I found myself sitting quite happily for about 15 minutes smiling as I looked at a seagull one day – probably sounds crazy?!) But recently its as if my mind has rebelled. Im not seeing the beauty now. My mind is racing a lot. Is this perhaps repressed feelings Im bringing up or what do you think? I don’t really believe in repressed feelings, but feelings come and go. It sounds like you had a very enjoyable time seeing the world as if for the first time, but all joys are impermanent, and we just have to accept their arising and passing. Paradoxically, doing this leads to greater joy, which hankering after past joys just makes us miserable. So I’d suggest that you start by accepting whatever feelings are arising right now, whether they’re pleasant or unpleasant. And accept the change that you see happening. You can never arrange the world so that you have an uninterrupted flow of pleasure. But you can experience peace when you allow pleasure to come and go. I just tried this for the first time; apparently my emotion was overwhelming sadness, and quickly I had tears running down my face. But then it went away. Hello. I have used your site to learn meditation and it has been very helpful for me. I have a painful past and because of that I am emotionally unstable. I have trouble feeling emotions and I have only recently learned how to cry. I have terrible mood swings about three times a day where I dip for no reason, and whenever I feel happy I soon shut off and stop feeling anything. I want to be able to feel and I think meditating will help. In fact, I was happy for the majority of a day, and this never happened before I meditated. I want to take mood stabilizers, but breathing meditation is helping. I don’t think of myself as anxious, but I really do have a lot of stress in my life. Luckily, I am self-confident and love myself, but I don’t know how to cultivate metta. I was feeling negative emotions, but the instant I tried to cultivate metta they disappeared. It was like I didn’t feel anything. I sat calmly and tried to experience emotions, but there was nothing there. It’s scary, it’s like I don’t have feelings like a robot or something. I feel blocked and I hope you have advice on how to experience metta. It sounds like you’ve fallen into the trap of “trying to make something happen.” Really we need to start metta bhavana by accepting whatever is there, without “trying” to experience emotions. The effort involved in the trying will just get in the way. I’m curious about those “negative emotions” that you were experiencing, because often people label things as negative that are merely uncomfortable, and sometimes they label things as emotions that from a Buddhist view aren’t really emotions at all. Can you say more about what you were feeling? This time I tried meditating along with your recording. It was very relaxing. Thank you for having it available freely. I realized that I experienced a sense of calm and peace. This usually occurs in the midst of meditation for me yet I start out with negative emotions. What I mean by this is I feel a darkness within me. It’s weird putting it like that because I don’t want to make it seem alive, but…it’s more a darkness than a feeling. I wake up with this darkness and meditate and pray right away. Throughout the day it manifests in unreasonable sadness, so talking to people is grating. It’s probably unhelpful that I get mad at myself for feeling sad because I have no reason to be sad; I am very happy with my life and hobbies and job and friends. But in the past, I really didn’t feel anything. I could watch a movie about murder and I wouldn’t feel compassion. I would understand the compassion, but I wouldn’t feel it. Also, it took me sixteen years to learn how to cry. So I did feel emotions, but they were buried so deep inside it was as if I didn’t have any. It intrigues me when you say that from a Buddhist view they aren’t emotions. What do you mean by that? “Emotion” isn’t a Buddhist term and doesn’t correspond very closely to anything in Buddhism, as far as I’m aware. Buddhism talks about vedana (feelings) and cetana (volitions). These are very different from each other. Feelings are non-volitional; the “darkness” you’re talking about is a vedana. It’s not really “darkness,” of course, but an unpleasant feeling of some sort (something like sadness). You can’t choose not to be sad — to let go of sadness. That’s what I mean by vedanas not being volitional. They’re not under our direct control. Volitions are things we do in response to vedanas. So getting mad at yourself for feeling sad is a volition. Volitions may seem to arise without our choosing them, because they are very habitual, but we can notice ourselves having an angry thought, attitude, or bodily expression and choose to let go of those things. It might take a little while for the volition to subside, but we can do it. So, vedanas are “received” and cetanas are “generated.” Vedanas are ethically neutral while cetanas are ethically active. They’re almost opposites. And yet the English word “emotion” includes both of these, which for me makes it almost useless as a category. A large part of Buddhist practice involves accepting vedanas/feelings — especially unpleasant ones – rather than reacting to them. So the thing to do with your sadness is to allow it to be there, but not to let is give rise to unskillful volitions — that is, volitions like anger, resistance, craving, etc., which make you even more unhappy. I even wonder whether you labelling this unpleasant feeling as “darkness” might in itself be an unhelpful volition, because that label carries a weight of metaphor: “darkness” representing badness, evil, etc. It might be more helpful just to call it an unpleasant feeling! Thank you! This does help. Hi, I just did the first meditation and the emotions that came up where black and intense and I got a feelin of needing to vomit. The feeling when you don’t want to but it’s unstopable. This feeling increased my thoracic blockage and I got a burning sensation. I kept on wishing myself well, but couldn’t change it. What is the goal with the upcoming emotion in a meditation? It was scary to feel that, it felt no good. It was dark and depressed, very strong. What do I do with it? Sometimes you’re going to experience unpleasant feelings, whether in meditation or otherwise. In meditation, because you’re focusing internally, those feelings can be experienced more strongly. And if your mind has a reactive tendency — for example to be scared of unpleasant feelings, then this can make them more intense. And then you may respond to those heightened sensations with yet more fear. What can start as a sense of mild unpleasantness can escalate into something quite overwhelming. But this is all just the working ground on meditation. What you’re working on is accepting unpleasant feelings, not trying to make them go away. You were trying to wish yourself well, but in an attempt to banish an unpleasant feeling. The part of you that was suffering was not being treated with kindness and compassion — it’s as if a friend showed up at your door in a state of distress and instead of inviting them in, sitting them down, and being a compassionate presence for them you slammed the door in their face in order to get the unpleasantness out of your life. So let those feelings be there. Send them your love. Invite them to stay for as long as it takes until they naturally move on. I am writing for some advice. I have a lot of trouble not talking about people behind their backs. I’m not doing this to be mean, but to get validation about my perception of others; to see if other people see the world and people the way I do. The problem is that I do it a lot (in other words, I often talk about others when I know I should be talking about something else) and also that I do it with the wrong people (so I’ll talk about one friend with another). I know that people feel close to each other when they talk about others (it is a way to bond) but I need to set limits and I need to do it appropriately. But, honestly, when I’m NOT talking about someone, I feel frightened…like something is happening and no one is acknowledging the elephant in the room. And that’s crazy. It’s like a form of paranoia. I grew up in a world of gossip and chatter…it’s very familiar to me and, like I said, a way to bond, but this habit is not working for me on a number of levels, and I want to untangle it and release it for everyone’s benefit. Thank you. I really just laid my heart on the line right there. Many of us are driven to unhelpful patterns of behavior by anxiety. Changing the behavior actually helps to deal with an anxiety. For example, I’m online a lot and I get anxious sometimes when I can’t access the internet. But if I go on retreat and unplug, I start to feel much calmer. So I’d suggest sticking with a personal precept of not talking about another person in their absence unless it’s to say something complimentary, or something you’d be comfortable with them overhearing. The anxiety will settle down. Question: I am sending love to my fears, to my dark places. I give value to the love I send to those places, I will not give value to my fears. Can this be considered compassion towards myself? Release from suffering and the source of suffering? It certainly sounds like self-compassion, Cathy. It’s good to remember that the bits of you that fear are not “bad” but are simply caught up in delusions, much like children terrified that there are monsters under the bed. They need kindness and reassurance rather than judgment and harshness. So as long as what you’re doing is along those lines, then I think what you’re doing is fine.